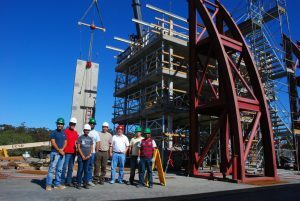 An award-winning team of researchers at the University of Arizona and partnering universities is working to develop buildings that will not collapse under the force of major earthquakes, such as last year’s 7.1-magnitude quake in central Mexico and 7.3-magnitude quake near the Iran-Iraq border. The two earthquakes were the deadliest of 2017, killing approximately 900 people combined, flattening hundreds of buildings and leaving tens of thousands of people homeless. The UA-led research team is turning its attention from vertical to horizontal transfer of forces by examining a less-explored, but critically important, piece of the seismic puzzle: steel collectors. These reinforcements in concrete floor slabs, or in special beams below them, are responsible for horizontally transferring earthquake forces.